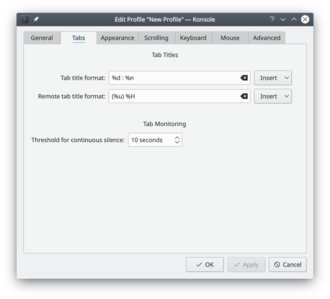 Konsole is an X terminal emulator for the KDE platform, allowing users to have a convenient way to use the command line. 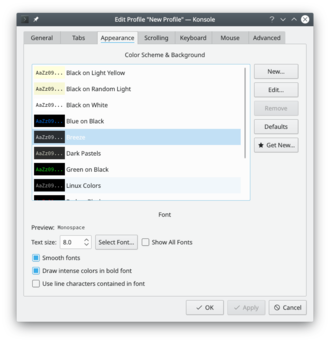 Aside from providing a way to use a powerful shell, Konsole also offers features that make it easier or more pleasurable to work in the command line, such as profile management, scrollback, and color schemes, including translucency for effects. 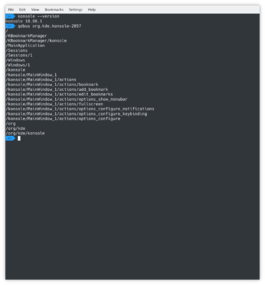 Konsole also provides an embedded KPart terminal which is used by apps such as Yakuake, Dolphin, and Kate, giving users a consistent and familiar interface when working in the command line. If you regularly use a lot of tabs, you'll sometimes find it convenient to label them. Just double-click on the tab and you'll get a re-name dialogue. If you are interested in helping with Konsole's development, check out how to help the Konsole team. This page was last modified on 17 November 2018, at 23:19. Content is available under Creative Commons License SA 4.0 unless otherwise noted.